Ooops, wanted to add this one as well. These are the adult pair. 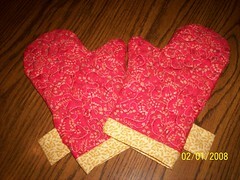 One thing though - I made these with polyester batting. Bad idea. 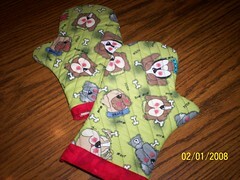 the childs mitts I made with cotton batting. Came out sturdy and warm. I would even double up on the batting for the front and back piece. Great quick project and a great way to practice quilting.